As already mentioned, October has been a month of shopping. This time I set out with a budget of 5,000/- to spend on an extremely popular website - Quikr. While I've had my love-hate relationship with Quikr in the past (because that's where I went when I was in search for an intern and I received odd calls at all hours since they gave out my phone number) I had never actually shopped there. I've heard of people who did, but somehow it never compelled me enough to take a look or even consider shopping or buying from there. So I started with what do people usually buy from Quikr? I asked my dad, and he said "buy a phone" - like as if the phone of my choice would fit in a budget of 5k - and my mom suggested "something for the kitchen" while Sheehan wanted a new camera lens. Personally I was stumped and I know that's its so obvious that I would buy a bag or a pair of shoes and while I did look for those, I was also looking at the pets section, particularly the cats. While my efforts to convince my parents we needed a fourth cat at home were futile, I still tried for 3 days. And after that failed, I went back to looking at shoes. One thing I noticed were that some people were fake (well they were really dealers and shop keepers and there is a little option on the sidebar to view products from individuals and not dealers, but even though I clicked on individuals, I still kept seeing these people who did not adhere to the rules of posting their products). 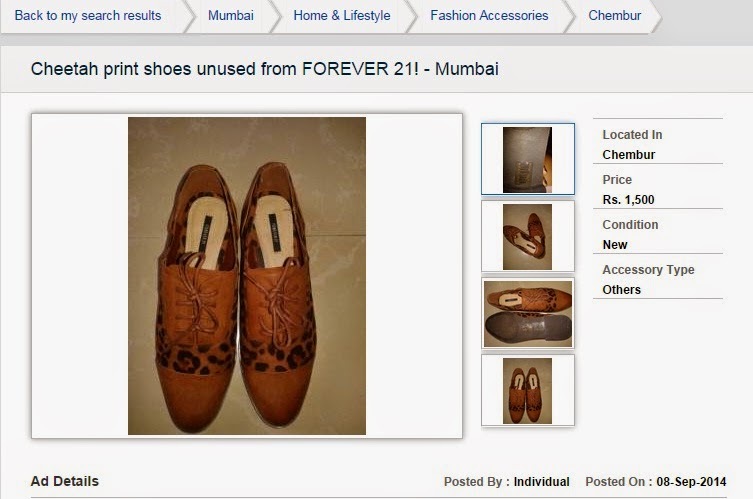 Another lot were scamsters (I happened to find someone selling basic Forever 21 heels for 3,200/- and as a shopping enthusiast, I can vouch and say that Forever 21 never charges that much for anything!) and finally there were the diamonds in the rough - the true sellers who wanted to get rid of pre-owned or unwanted items they purchased. I chanced about a pair of Forever 21 shoes (not from the scamster but by another simpleton) while searching the fashion accessory section, that were totally me - Oxfords with animal print. And as luck would have it, they were in my size. So there was no looking back, I of course had to get them. 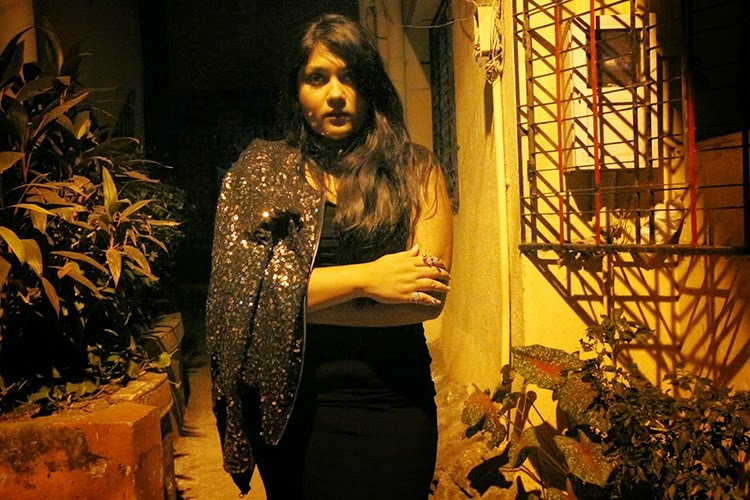 After days of co-ordination with the seller who happened to be a 12th standard girl and tried to make my life some sort of living hell and also felt the need to tell me that she was going to her sister's house for 'tp' ad she was going clubbing the next night and had some unreasonable expectations of me, reaching her place/locality within 20 minutes notice. So I had to be stern and told her to figure out a way before I changed my mind about the shoes. My words may have left an impact and the very next day I was able to send someone over to pick them up. While I checked the shoe section, my other tab had the bags - luggage section open. But nothing I saw actually interested me. 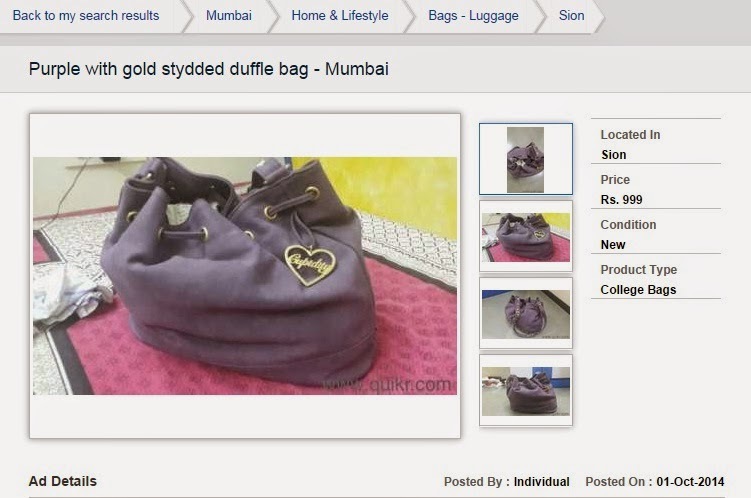 But after scrolling through hundreds of fake LV bags that were 'first copies' the colour purple and a familiar logo caught my eye. 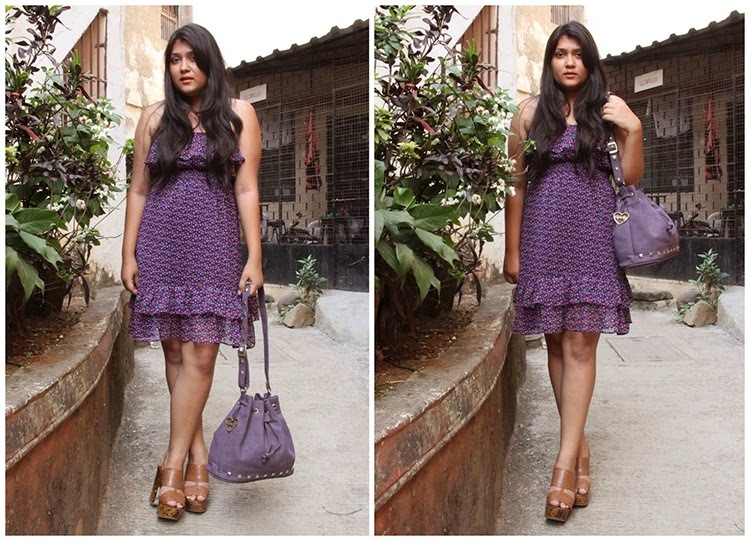 Purple is my favourite colour, so it always does catch my eye. However the logo belonged to Cupidity by Karishma and Masumi! So that was my second purchase! After having lucked out twice, I thought this was it, I'm really not going to find anything else. Also I had half of my budget left. What were the chances that I would find something that I liked or even wanted for that same amount? So I halfheartedly started checking the clothing - garment section, again, and kept telling myself I will find something good, and I did, 38 pages later, to be exact! I found someone selling a sequined Vero Moda cardigan that was exactly in my budget! A quick trip to Byculla and the jacket was in my hands, and it was the prefect buy, especially for the coming winter season. And that's what I got eventually. I fell into the cliche of a fashion and style blogger buying only shoes and bags and clothes, but those didn't come easy. It came to me after hours of extensive search. And I'm actually really happy. The jacket seems to be taken down already. I contacted all the three buyers via text, since I'm really awkward and shy to pick up the phone and ask a random stranger if they were still selling their listed item. All co-ordination happened over text and a few short calls from there onward. Tips for any future Quikr purchases..
Be cautious, or else you might end up getting scammed. It's not entirely possible for Quikr to check up on every listing, but as a buyer, it's your responsibility to do your own research and make sure you don't pay extra for anything, no matter how much you may think you need it! The best things fall after the 20th page, or atleast in my experience, that's where I found what I liked! Be nice to the seller, they might even give you a discount on the mentioned price. Didn't happen to me, but how awesome would that have been?? If courier and bank transfers don't work for either you or the seller, it's advisable to meet in person at a pre-decided common spot, where you can also have a look at your new purchase before you actually buy it.